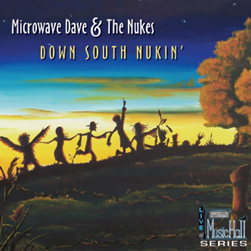 Samples from "Down South Nukin"
Microwave Dave & The Nukes - Fifteen-plus years of performances in the U.S. and Europe and five albums with more on the way have helped Microwave Dave & The Nukes establish a wide multinational audience. Venues vary from French soccer stadiums to Bike Week in Daytona Beach, from blues cruises on the Big Red Boat to neighborhood saloons, but the thousands of shows delivered by the band all reflect one core element: the heritage blues music enjoys as a lifter of spirits. As Microwave Dave puts it: Blues is Americas first and still best self-help program. Formed in 1989, Microwave Dave & the Nukes blues apprenticeship included a three-year stint as Jerry Boogie McCain's back-up band, interspersed with shows backing Bo Diddley, whose styles are integral flavors in the bands recipe. Microwave Dave & the Nukes are best known for their 1995 European hit "Road Runner" from the album " Goodnight Dear" which was produced by Johnny Sandlin (Allman Brothers, Widespread Panic). Their sixth album , "Down South Nukin' " also produced by Sandlin , is a long awaited live album recorded in Gadsden, Alabama, and includes new songs from the band as well as some of the best songs from their prior albums.